Many mainstream media websites helped a fake video go viral this month. The video showing a young Syrian boy running through sniper fire to save a little girl, was exposed as a fake when the Norwegian producer Lars Klevberg made the fact public. One of the stated aims of the Norwegian film makers was to “see how the media would respond to a fake video.” This article examines how that experiment went. The western press very quickly accepted the video as real and used it to support the US administration’s narrative on Syria. Many top US news sources began to spread the story. Even though the producer said he explicitly added big hints that the video was fake, like the children surviving multiple gun shots. Propagating false stories on Syria, is nothing new for the western press. In the lead up to the conflict many stories were exposed as frauds, such as the Anti-government activist “Gay Girl in Damascus” which turned out to be a middle-aged American man in Scotland. Syrian Danny Abdul Dayem which was frequently interviewed by CNN was using fake gun fire and flames in his interviews. The fake sniper video wasn’t enough to support US government narratives by itself, as the now deleted original upload didn’t suggest the identity of the snipers. So the west’s media suggested that it was Syrian military snipers that were targeting the children without any evidence. Journalists failed to mention how they reached the conclusion that an actor in Malta was shot by the Syrian military. 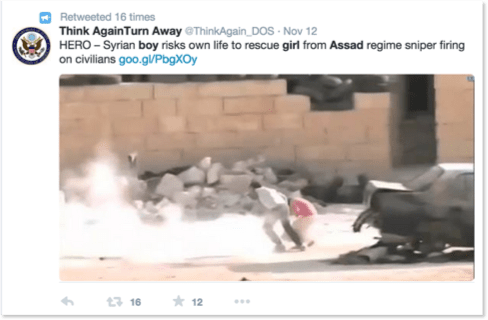 It may be that the western press is quick to trust pro-rebel sources, as the video was uploaded by the pro-rebel Sham Times along with their own twist. The Guardian’s headline for the video was “Syrian boy ‘saves girl from army sniper’” and the Telegraph delicately suggested the Syrian military was responsible for the fake bullets. The International Business (IB) times stated, “the snipers, who reportedly are said to be the government forces loyal to Syrian President Bashar al-Assad.” IB Times never explicitly mentioned who reported this information. They then took it a step further and concluded the article with “the incident certainly is not the first time that Pro-Assad gunmen have targeted children”. Well it is at least not the first time the mainstream media has presented false reports as fact. In 2012, CNN claimed a bullet that killed a four year old girl in Aleppo was shot by government snipers even whilst admitting the bullet came from rebel held buildings. Other journalists took to Twitter to make unfounded claims about army snipers targeting the boy. Vinnie O’Dowd who has done work for Channel 4 and Al Jazeera tweeted “Syrian Regime Targets kids. Liz Sly of the Washington Post tweeted incredulously that “Soldiers kept shooting” at children. These tweets were inline with an official State Department Twitter account @ThinkAgain_DOS which blamed Assad for the fictitious bullets in the film. This casts doubt on how deeply the US administration scrutinizes information it bases it’s policy on. In 2013 they relied heavily on video footage provided by rebels to support its planned attack on Syria in the wake the Ghouta chemical attack. This is very strange since both children in the film walk away after being directly and repeatedly hit by bullets. The creators of the film said he purposely scripted this as a big hint that the video is fake. The lack of scrutiny the media experts employed suggests incompetence or the same level of bias as the media that employs them . Heather Saul of the Independent wrote that one of the ‘Middle East experts” she showed the video to was from Human Rights Watch. Indeed, Human Rights Watch European Media Director Andrew Stroehlein, showed no doubt on the authenticity of the film when he tweeted it out to his followers. The New York based human rights organisation is not new at tweeting false information, last month they used an image of the Odessa fire, where US-backed militia’s burned thirty two people to death, as an example of ‘Putin’s repressive policies’. In 2008 Venezuela expelled two HRW staff members accused of “anti-state activities” after producing a report against the Chavez government. Guardian journalist Hugh O’Shaughnessy accused HRW of using false and misleading information in the report, as well as pro-Washington bias. In 2009 HRW received financial donations from the Saudi government which may, in part, explain the anti-Syrian slant. HRW employed so called video expert Eliot Higgins and his colleague Daniel Kaszeta to investigate the August 21 chemical attack in Ghouta, and quickly reached the conclusion the Syrian government was behind the attack. Daniel Kaszeta was referred to as a fraud by prominent physicist and MIT Professor Theodore Postol. HRW’s CEO Kenneth Roth recently used a report by Eliot Higgins to make unfounded claims about Ukrainian rebels shooting down Malaysian flight MH17. Heather Saul did not respond to questions on whether Eliot Higgins was one of the expert she asked for advice. However the mainstream media’s most often quoted video expert, did not recognise that the video was a fraud, tweeting cautiously that he wasn’t sure if it was authentic but gave the video a reaction non the less. However many viewers who aren’t referred to as video or Middle East experts, immediately recognised the video was a fraud and flooded social media sites Twitter and Youtube with doubts on its authenticity. If Heather Saul had used these individuals as experts rather than HRW, she would have reached the correct conclusion about the video. But perhaps it is this unbias eye that the mainstream media avoids. The vast majority of Higgin’s conclusions support US government narratives and agendas, and that’s the kind of bias the mainstream media prefers. Instead of humbly accepting blame for spreading disinformation, many western journalists and their experts reacted by blaming the producer of the film. The collective rage of the entire mainstream media forced the film’s producer to delete any trace of this 30,000 dollar experiment. Some journalists took to Twitter to express their rage at being exposed as easily duped by convenient propaganda. The experts that were fooled by the video also strongly protested. HRW posted a complaint that the fake video “eroded the public trust in war reporting’, in other words blind trust in HRW analysis and war propaganda. Eliot Higgins posted an open letter to the producer of the film on his website Bellingcat, condemning the film. GlobalPost referred to the film as ‘irresponsible and dangerous’ but not because it could be used to promote wars and make false accusations. What the real danger to the mainstream media and their experts seems to be, is that as a result of the films exposure as a fraud, future video claims may now have to be properly scrutinized and the public may not be so unquestioning in future. However it is the journalists’ lack of scrutiny that is truly what is irresponsible and dangerous. Had the director not admitted the film was fake, these journalists more than likely would have kept promoting the story as an example of Syrian Army war crimes.